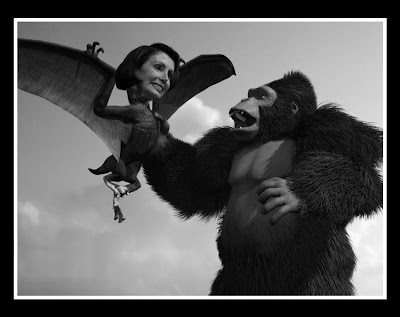 Continuing my walk down memory lane (see previous post), I was reminded of some Photoshoppery I made in November 2006, right before Nancy Pelosi was nominated as Speaker of the House. The truth simply is not in the boundless and deep black of her soul and she cannot be approached with recourse to reality. I once heard it put that if we could hear insects think, it would most likely sound relentlessly mechanical; something like an old-time mechanical cash-register cycling endlessly, without the occasional diversion of the bell. I cannot hear the noises in her head and wouldn't want to in any case, but she really is that inhuman. She has always made me think of a screeching harpy, and something in a 2006 photo of her struck me as particularly reptilian (go figure). And so I present to you, dear reader, the results of the inspiration that hit me almost exactly three years ago: the dreaded Pelosidactyl! It's a common misconception that the Pelosidactyl and King Kong lived during the same time period. However they actually lived decades apart.